CHEYENNE, Wyo. – More than 600 tickets have been sold to the christening celebration of Union Pacific Big Boy No. 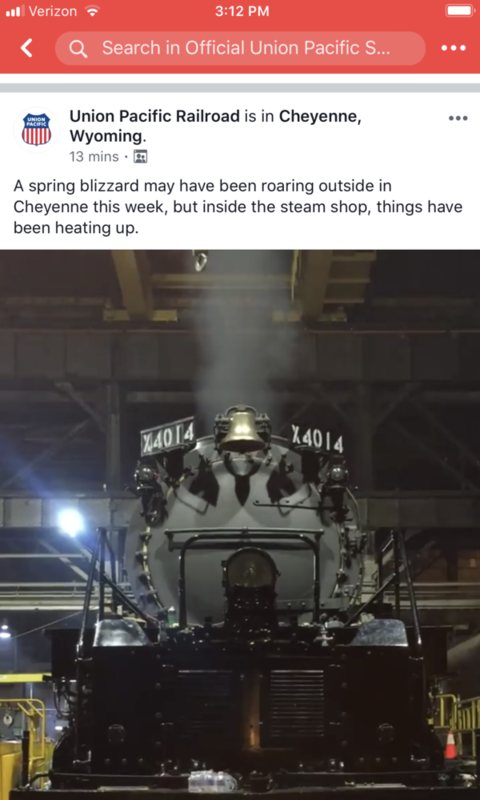 4014 at the Cheyenne Depot Museum on May 4. 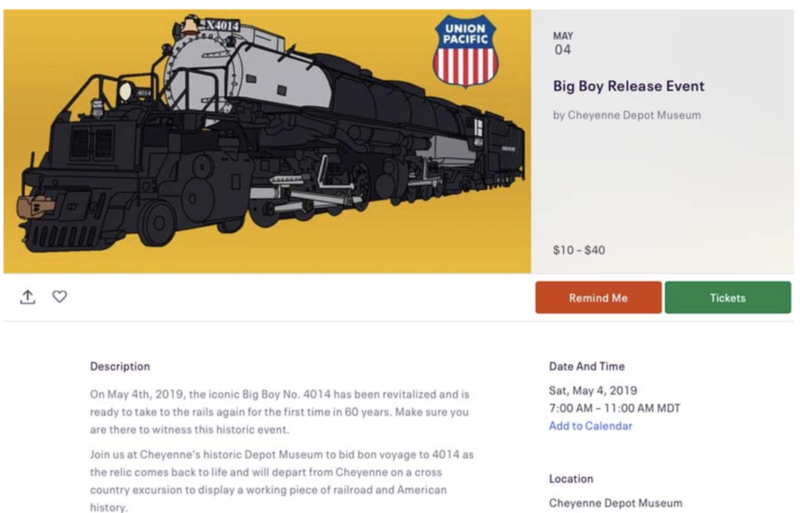 As of Monday morning, Christy McCarthy, executive director of the Cheyenne Depot Museum, tells Trains News Wire that all of the “VIP” tickets have been sold and there are approximately 195 general admission tickets still available. General admission will grant ticket holders access to the parking lot next to the depot where the locomotive will be parked prior to leaving for Ogden, Utah, to celebrate the 150th anniversary of the First Transcontinental Railroad. To purchase tickets, go to the museum's page at www.eventbrite.com. Posted April 3rd by the UP Steam Club Facebook Page. I edited out some of the extra verbiage. Enjoy. Here's a close up of the new eccentric link, trunnions, hand fit tapered dowel pin and hand fit, tapered fit bolts with castle nuts. The eccentric links are part of the valve gear and they can be easily seen in side view photographs as boomerang shaped devices above the wheels. Those are some serious cotter pins right there! "hand fit tapered dowel pin and hand fit, tapered fit bolts"
And right there is one of the reasons we watch Diesel-Electric power instead of Steam: labor. Although they are simple machines compared to Diesels everything about Steam is labor-intensive. ...The institutional knowledge of how to descend steep grades using only air brakes went out the door with the retirement of Engineers and Road Foremen who had done it. Railroads don't teach people to run trains the way they did when you and I railroaded, Tom. Mention the term "stretch braking" to a modern railroader and he'll think you are from Mars. Mention "cycle braking" and you'll get the same look. They only teach them what they need to know to get over the road when everything is working properly. So what happens when the DB craps out as you are half-way down a long mountain grade? Somebody bring a truck full of knuckles...or worse. It's all computerized now, and Lord help us if something goes wrong with the computer! The days of truly understanding your locomotive, thinking on your feet and patchin' 'er up to get over the road and home if you have to, are long gone. Today the mantra is to just be a mind-numbed robot and do what you're told. Don't think. We are seeing the same kind of thing in aviation. I watched an American Airlines training video the other day entitled "Children of the Magenta Line." (The course line in aircraft Flight Management Systems appears magenta in color on the Multi-Function Display screen.) The whole point of the training session was to train pilots to get their heads out of the computer and just FLY THE PLANE! There is an entire generation of pilots whose first inclination whenever something changes the plan is to start banging keys on the computer. The Aisiana Air crash in San Francisco is a PERFECT example of that. The pilot didn't want to fly the aircraft, (he didn't know how to fly the aircraft, but that's another story...) he wanted the computer to do it. But he didn't even know how to properly program the computer! People died. While younger railroaders may point to us "old heads" and think we are dinosaurs trying to re-live our glory days from the past, there is strong evidence that useful and important institutional knowledge is rapidly disappearing from the railroad industry. And that is NOT good. where do these update photos show up on the UP Steam Club Facebook page? I'm a member, and I go there, but I NEVER see the photos I see in this thread. I will admit, that Facebook and I have about the same relationship as I have with my smart @!#@@!! phone. We all have seen some of the most successful dinos of all time: BIRDS. According to a recent article in TRAINS, what killed steam on the N&W was shop not over the road costs. The other thing that killed steam on the N&W was the loss of part suppliers; air pumps, dynamos, etc. etc. peculiar to steam engines. Nice! I was just wondering today when they’d put a fire in her belly. Progress.... Looking forward to video clips of 4014 moving under its own power. Is the cab back in place and the lagging installed? 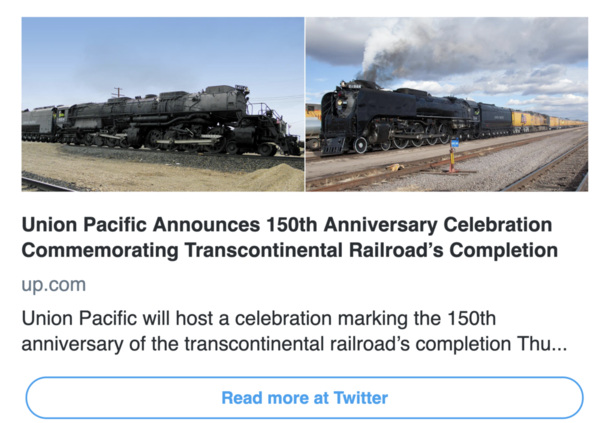 Today the Union Pacific Railroad put out a press release and this press release can be read on their Twitter Page. below is the link and the cab is back in place and the lagging is installed. They did attach two file photos but no new photos. Google News & Associated Press have reported on the UP’s press release. At 1:12PM RMT today the 4014 is heating up. These images are from the Union Pacific Steam Club. Gary, from another guy in Michigan, thanks for the time you spend keeping us updated. I've appreciated it. Anyone have any ideas what kind of burner that is? 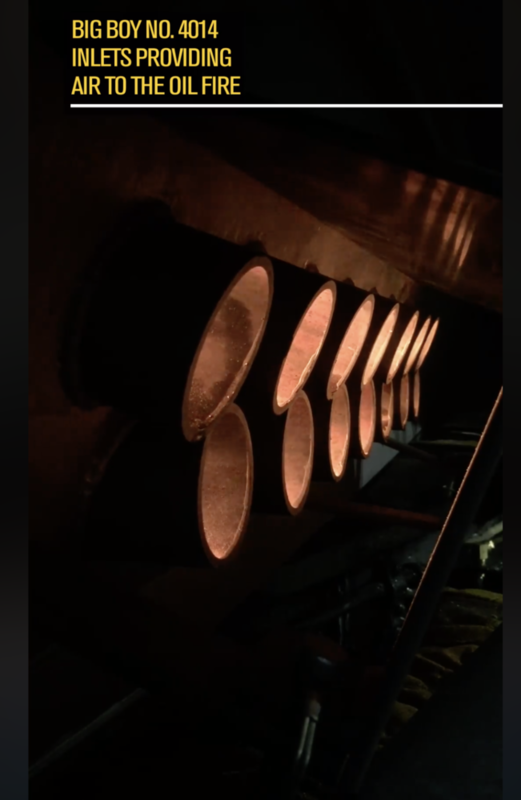 Wow, the photo of her with smoke coming out of the stacks that isn't piped in for the effect (like 4023 had at Omaha for a while, from a steam line from the shops when she was down at track level). I wonder if everything is back together and the rods are on? Like many (if not all) of you, I want to know the first time she moves under her own power. I bet there'll be quite a crowd the first time Ed pulls back on the throttle. I'm no fan of UP, but I get the exoticness and historical importance of having an operational Big Boy. Your welcome. Thanks for taking a look, I appreciate it. I would like to hear from you, please feel free to hit me up with an e-mail. Below is an image I forgot to add, it is a side view of the drivers. #1 - On the outside of the 4014 where is the inlets for the oil burner? #2 - On a car we have an air cleaner with a filter. Is there a filter system for the oil burners to keep out dust & dirt? 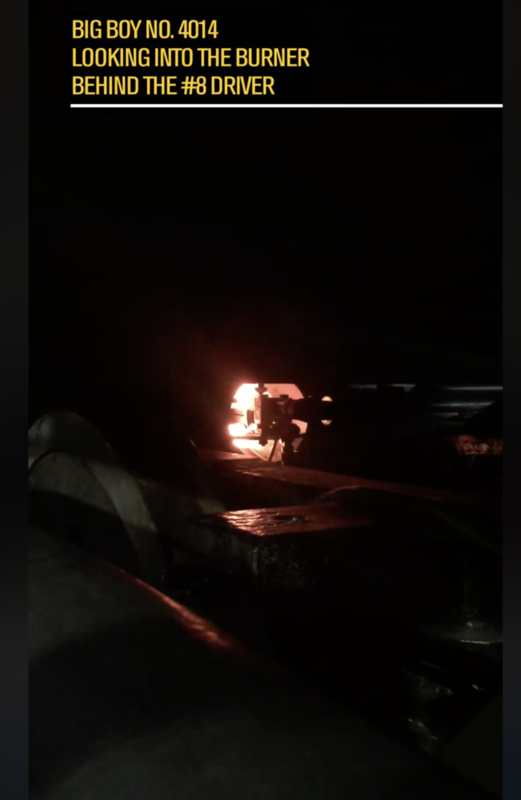 No Big Boy expert, but on most oil burners, the burner itself is positioned at the front of the fire box, between the frames. You normally wouldn't easily be able to see it. No, no filters are used. In fact, on an oil burner, great quantities of sand are deposited into the firebox in order to scour the tubes and flues of soot! So the rods are on? I keep wondering when she'll move on her own power for the very first time, even just a few feet. Talk about a historical moment! I wouldn't be surprised to find out that she already has. Nor would I (the people in that roundhouse, I'm sure, can't wait to see it move alone), but I'm dying to see photos of a complete, UP 4000 under steam! All that new plumbing up on top of the boiler indicates that they have removed the Wilson Blowdown Sludge Separator system! That was the excellent boiler blow down system that Alco used which did a great job of keeping the boiler clean while moving over the road. The 800s, 3900 Challengers, and the Big Boys all had these sludge removers on them. This same Ed Dickens-inspired "improvement and simplification" was done to to 844 a few years ago, which resulted in worst case of boiler sludge, scale and crap build-up in the boiler that I have ever seen! Better get your pictures on Day 1, before this thing dies from the boiler becoming totally plugged with sludge. Did Ed provide a justification for this removal? I'm curious. This should make it even more exciting! The beauty of working for private enterprise is that he doesn't have to justify anything to anyone except his supervisor. Railfans often forget that detail. Strasburg Rail Road Mechanical Dept. From what I understand, UP notoriously had "bad water". That could have been anything from high suspended solids to high calcium content. Chemicals are typically added to encourage precipitation of these solids aka "mud". The solids end up on the bottom of the boiler. They (most) flushed out with the bottom blow. The Wilson Blowdown Separator centrifugally separated the "mud" from the water. Going out on a limb here, I would expect that this device would be more efficient use of water. Does UP use municipal potable water? Perhaps the water used today is inherently "better". Is there a Zeolite water softener anywhere in the system? Do UP boilers get an intensive wash-down after each excursion? 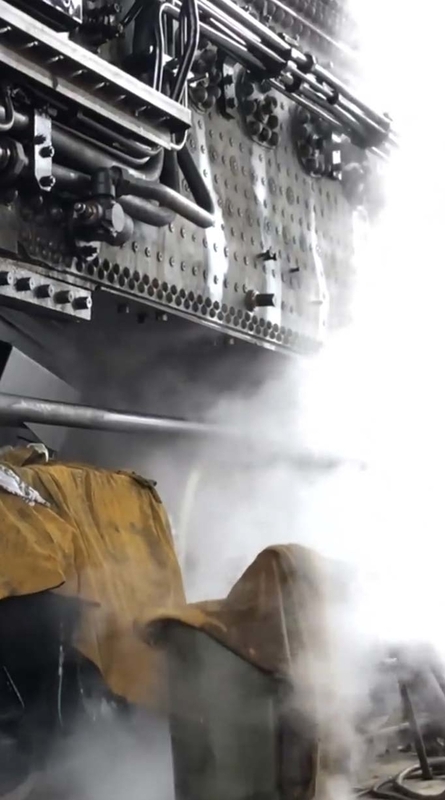 Well, there is more than one way to drain water out of a boiler. It ain't rocket science. What will you say when it makes it to Day 2? Rich did not mean day 1 literally. Boiler sludge takes time to accumulate. But if not properly taken care of it is only a matter of time. Oh I get what he meant, but I have to laugh at his and other's continual doomsday warnings. Do you know if the 3985 still has hers? And aren’t there other ways to clean a boiler of sludge and scale? And aren’t there other ways to clean a boiler of sludge and scale? Of course. Wilson separators are 80 year old technology. Boiler technology and water treatment have continued to make advances during the intervening years. Mention "cycle braking" and you'll get the same look. They only teach them what they need to know to get over the road when everything is working properly. I understand and have done stretch braking, but cycle braking is a term I've never heard before. What is it? I have a certain history with 4014. 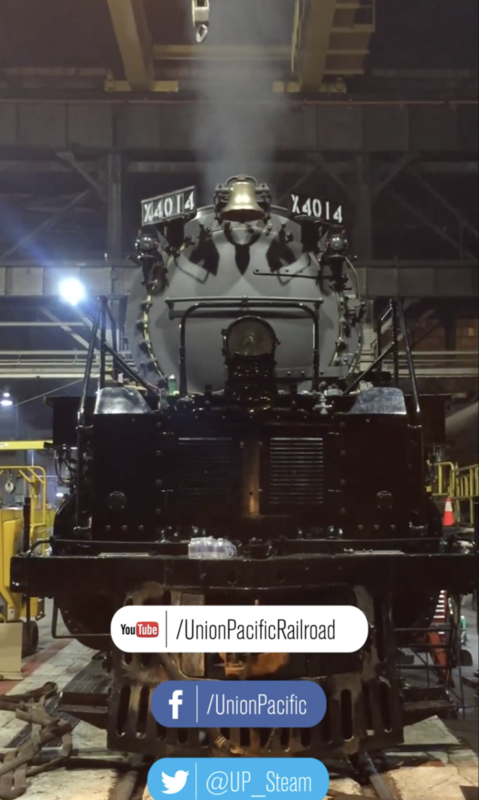 When I belonged to the AGHR railroad club we would visit the 4014 at the Pomona Fairgrounds, I had the pleasure of sticking my head into the firebox, it is big, very BIG. 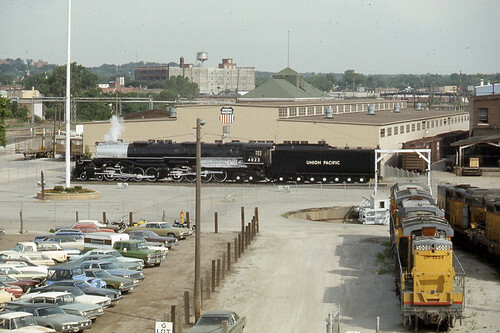 We visited it when there was a train show at the fairgrounds, back in the good old days. I plan on chasing it also when it comes to California from where it came.